Good morning. The sun is shining and the weatherman is promising us some warmer temps for today. There is still some snow in our yard, but it will probably all be gone by this afternoon. After that, the colder temps will be back. These past two days have been very quiet and lazy. Aside from a couple of household chores, I really did not do very much. I did finish addressing, stuffing and stamping all my Christmas cards, and I wrote out the address labels for some mailer envelopes. Yesterday, DIL Janet came by with a big pan of home made cookies. Oh yum!! I've set aside a few of them for myself, and the rest are for sharing. In the afternoon, Joe put up the Christmas tree out in the main house. I'll be putting mine up sometime this week. I still have some wrapping to do, so I'll probably work on that this afternoon while the laundry is washing. I was going to do some food shopping today, but I really don't need anything so I guess I can cross that off my "to do" list for today. 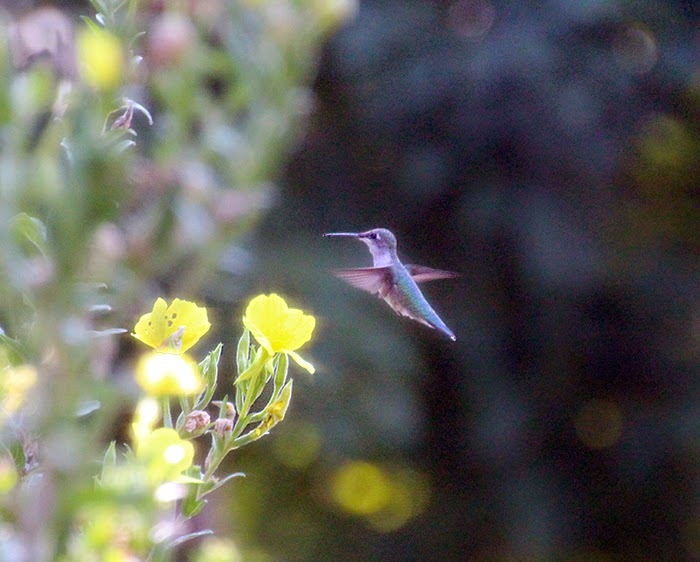 Today, I dug into my photo archives and pulled out some shots of a hummingbird that I took through the kitchen window when I was working. Sad to say, I haven't seen any of these since I stopped working. Next Spring, I'll try putting their feeder on the other side of the house to see if maybe it will lure some of these beautiful birds back to my yard. Well, that's about all the news for this morning. 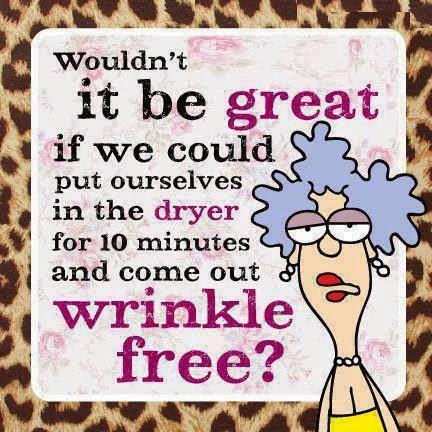 I think I'll make myself a hot cup of java, and get the laundry started. So, till tomorrow, Y'all have a fabulous day. Good morning. This morning it is Brrrrrrr! outside my door. It is snowing and cold. Thank goodness I left that windshield cover on m car. 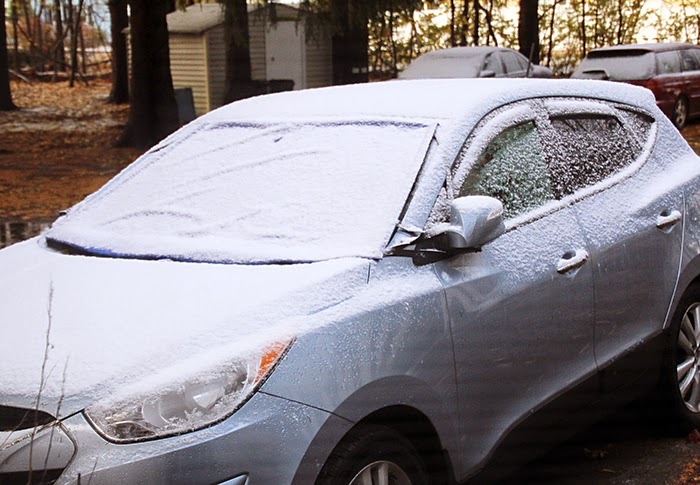 I have to go out food shopping later today, and I won't have to clean my windshield. Several of the dwarfs and I enjoyed a fantabulous dinner, which Dwarf Helen had cooked. Deanne, Eddie and the kids came by to wish everyone a Happy Thanksgiving and brought lots of tasty home-made goodies for desserts. It was definitely a wonderful day. 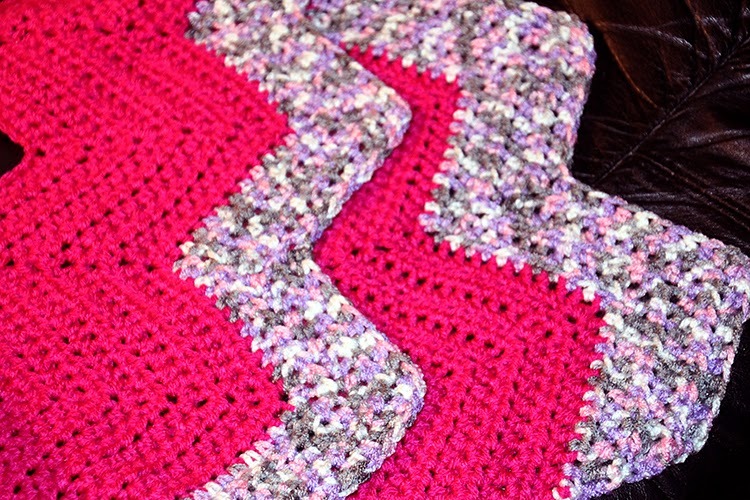 After a short nap, I spent the evening watching TV and crocheting a few more rows on the shocking pink afghan. A nice quiet ending for a fabulous day. Today I am sad to see so many unhappy folks in the news on TV. Mainly, it's the protesters (of the Ferguson, MO incident) who are still causing all sorts of trouble for innocent folks. Folks in their town had to cancel their holiday parade, and even this was not enough. Groups of these protesters have gathered in different cities to crate havoc for other folks. I guess for some folks violence is happiness. If these were my neighbors, I would do my best to move away to a friendlier area. Folks like these protesters are never happy if they don't have something to fight about. I would not want to be a young person trying to grow up in today's world. On a happy note, I have a couple more photos to share from my visit to the park the other day. I like to call this first photo "Seagull Ballet". 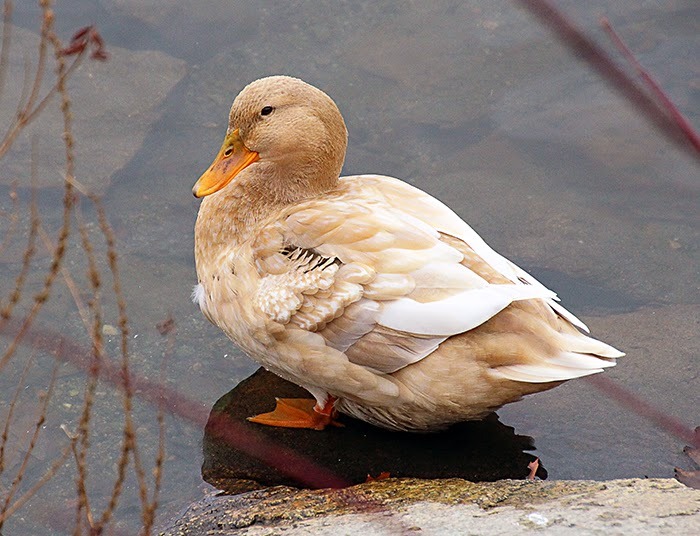 I thought the duck in the second photo was just downright beautiful. Well, I'm happy to say that the snow has stopped falling. This is good because I wasn't looking forward to driving in the snow. Hopefully, the supermarket won't be crowded today. I'm watching the weather forecast, and it is supposed to be much warmer on Sunday. I really don't need very much at the market so maybe I'll wait until Sunday to do the grocery shopping. We'll see. That's about all the news for this morning. So, till Sunday, Y'all have a wonderful day. Good morning, and Happy Thanksgiving Day to everybody. 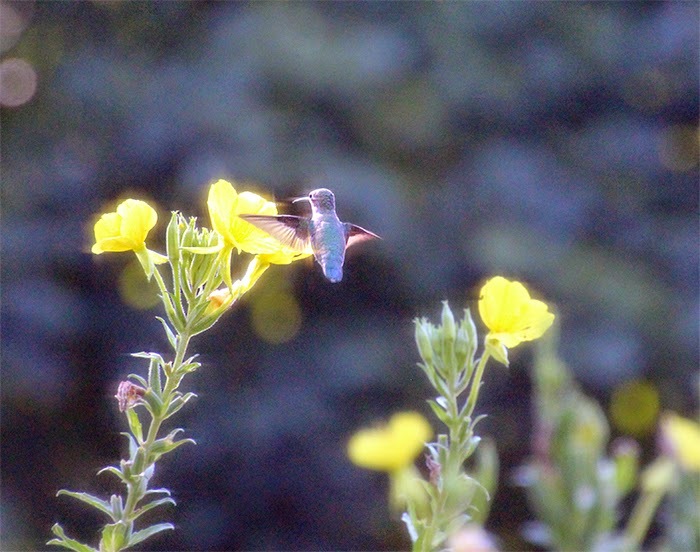 Our day here in my little part of the world is starting off with the sun popping in and out, and no rain or snow. It rained here until late into the night, and then it changed over to a bit of snow. It wasn't very much snow so I'm okay with it. I know most folks are very busy today with cooking the turkey and preparing lots of veggies and pies, so I'm not going to gab a lot. I do, however, have some photos to share that daughter Deanne took with her phone one day recently while riding in the car. 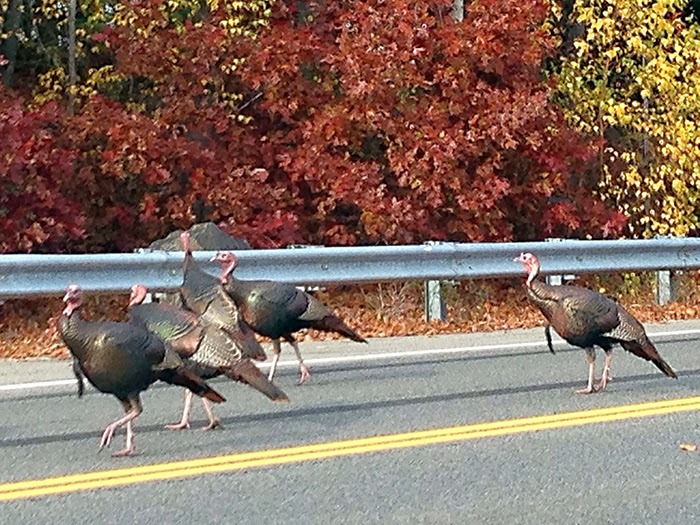 There were lots of turkeys on the side of the road. 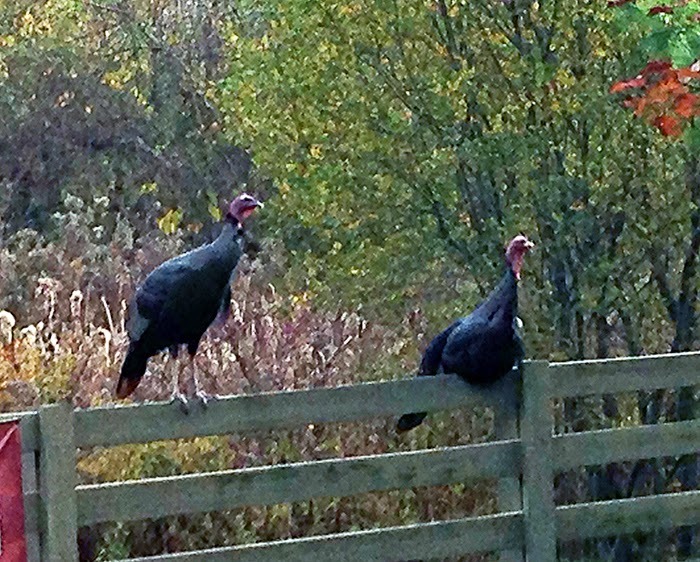 Some were sitting on a fence, some were looking for food in the field, and others were walking on the street. I thought these photos were very appropriate for today. Thank you Deanne for sharing these fun shots. Now I'm going to the kitchen and whip up some scrambled eggs for myself and Pogo. I saved a little piece of steak from last night's supper, and I'll cut it up and mix it in with Pogo's eggs. Hopefully, he'll enjoy this. Before Y'all settle in to your delicious turkey dinner, take a few moments to give thanks for all the wonderful people and things you have in your life. Till tomorrow, Y'all have a Happy Thanksgiving Day. Forecast For The Holiday Is Wet, Wet, Wet! Good morning. 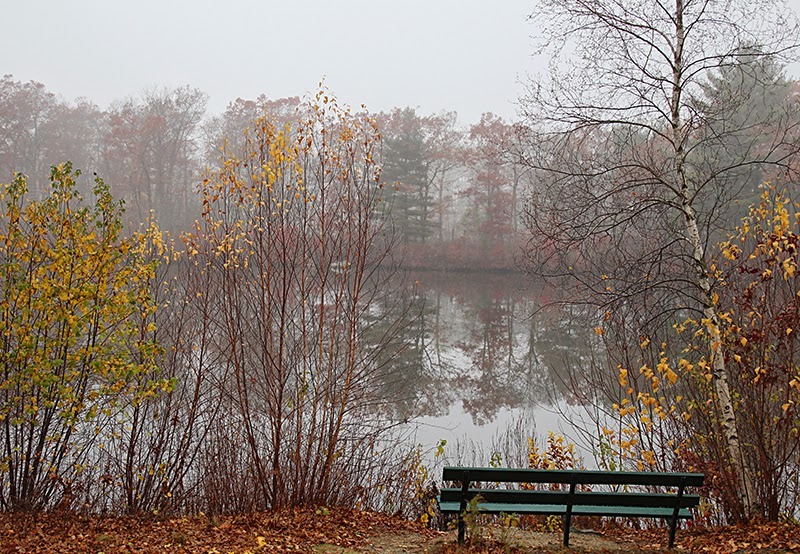 The weather here is a bit drab, gray and damp this morning. 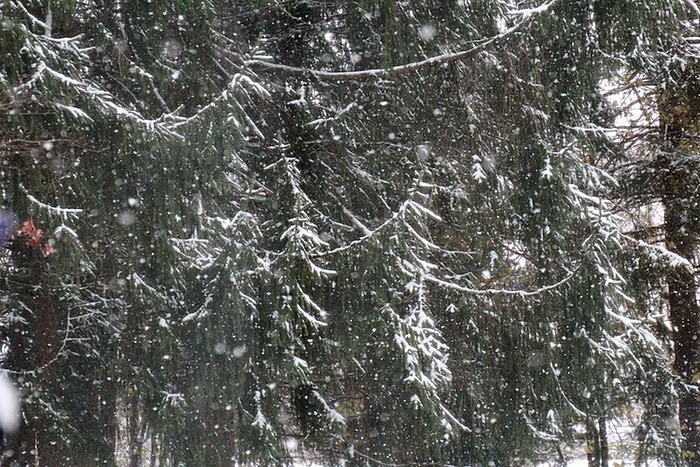 I don't know if the snow is still coming, but there is supposed to be a lot of rain forecast for today and tomorrow. 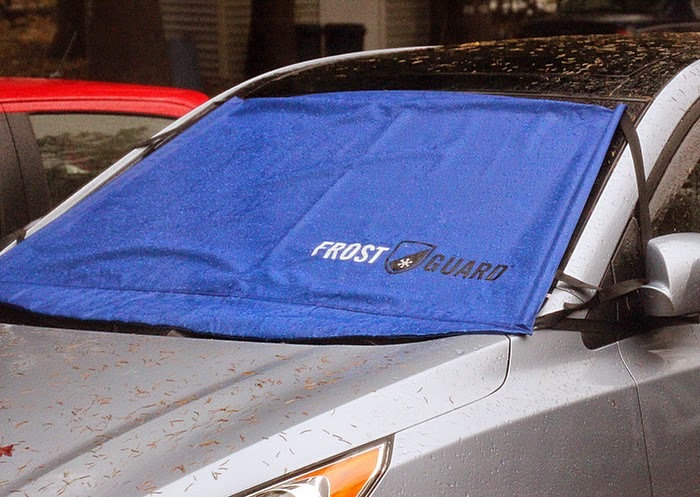 Yesterday afternoon, I went outside and put a weather protector cover across the windshield on my car. This way I would not have to clear away the 3-5 inches of snow (that was coming) from the windshield. So okay, there's no snow yet, but at least I'll keep all that rain that's coming from getting all over my windshield. (I thought that might make me feel at least a little bit smart, but it didn't help at all.) Some days you just can't win for trying. 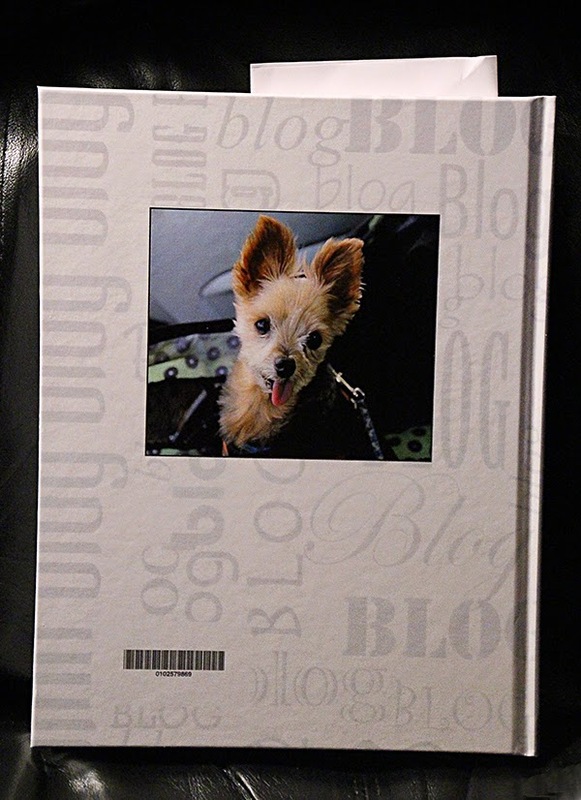 Yesterday, Pogo and went to the Post Office and mailed off a birthday box to daughter Audrey. Her big day is coming up on Monday. This is always a fun trip for Pogo because everyone at the Post Office loves to see him. 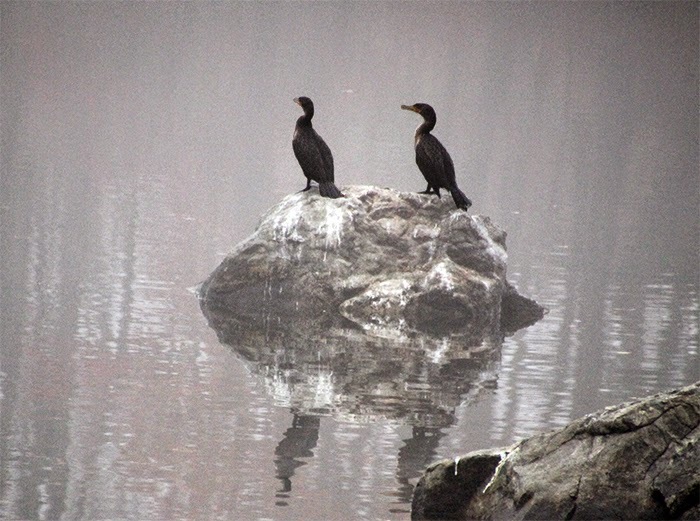 Next, we went to the park to see if the cormorants were still there. Unfortunately we did not see them. 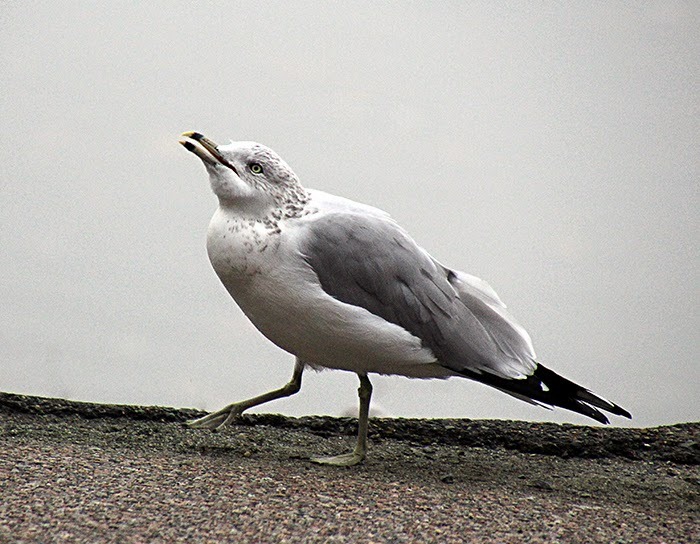 However there were lots of other birds to watch. 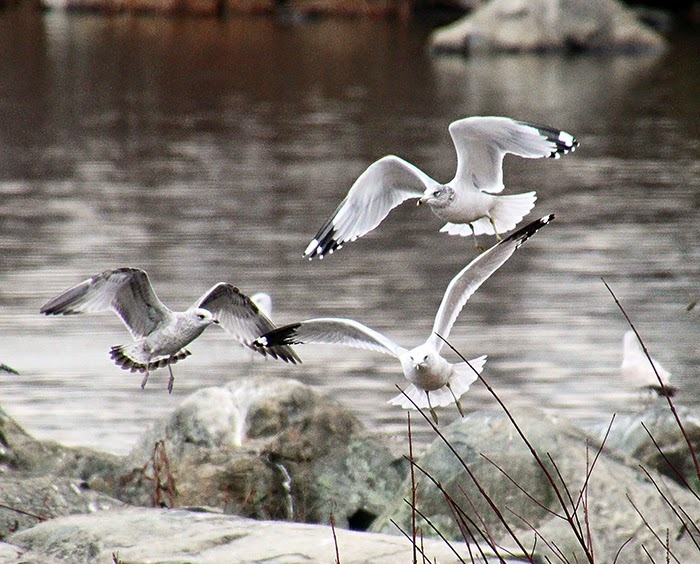 I especially love the seagulls and the ducks. 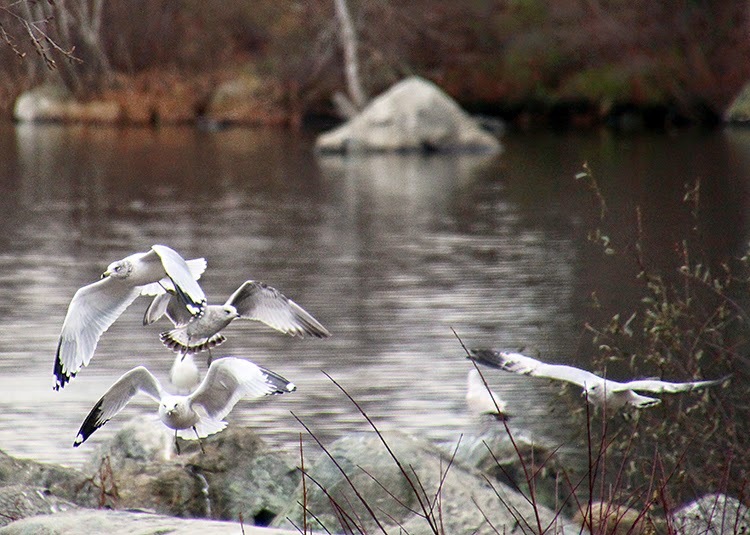 There were a couple of folks there tossing out food for the birds so I was able to get a few nice photos. If the photos look almost like black and white, it's because the sun had been covered over by clouds. Here's a pretty shot of this part of the pond. This park is huge and covers quite a large area across two towns. This is the area that I visit most often. I'll have more photos to share once I've had a chance to go through them and crop some for posting. The rest of the day was fairly quiet, and after supper I worked a bit more on the shocking pink afghan. I know it looks a bit bright, but it is really very pretty, and I know a little girl who might like to have this come next Christmas (2015). Yes, I'm already working on my shopping list for Christmas 2015. I like to start early. Actually, I like giving home made things, and to do this one must start as early as possible. It keeps me busy and quite happy. Today everyone I know is quite busy (or will be after work) shopping and cooking to prepare for tomorrow's dinner. I hope all of you will be celebrating with friends and loved ones. If you know someone who will be alone, why not prepare an extra plate and take it to them. Better yet, if you can, invite them to come celebrate with you. You'll be ever so blessed. On that happy note, I think I'll have me a cup of coffee and do a bit of blog reading. Till tomorrow, Y'all have a wonderful day. Good morning. At the moment, it's a fairly warm 57F degrees, and will get up to about 61F. We're supposed to have sunshine on and off throughout the day. Enjoy it New Englanders. Tomorrow isn't looking as good. The weatherman says we'll have 3-5 inches of snow plus rain tomorrow, and more rain on Thursday. Oh goodie goodie. This morning all the news seems to be about the Grand Jury decision on the Michael Brown shooting. Isn't it sad that so many people seem to think that violence is the answer to everything? Last night, the protesters in Ferguson, Missouri caused a lot of damage to properties, and they burned a whole row of businesses because they were not happy with the Grand Jury decision. Sad, sad, sad. The other big story on the news is how holiday travel this week will be a bit messy, thanks to winter storm Cato. Add to this more than forty million vehicles on the road and I sure am glad that Pogo and I will be staying right here at home. Well, last night I started working on the Delft Blue afghan, but then I put it down and dug out the Shocking Pink yarn and started a new afghan. No worry, the other afghans will get done, but I've been wanting to work with this Shocking Pink yarn for quite a while now. I have to say that it is working up really pretty. So, as you can see, I have lots of pretty things to work on for quite a while. Another perk of retirement - I have the time to do some of the things that I really enjoy. 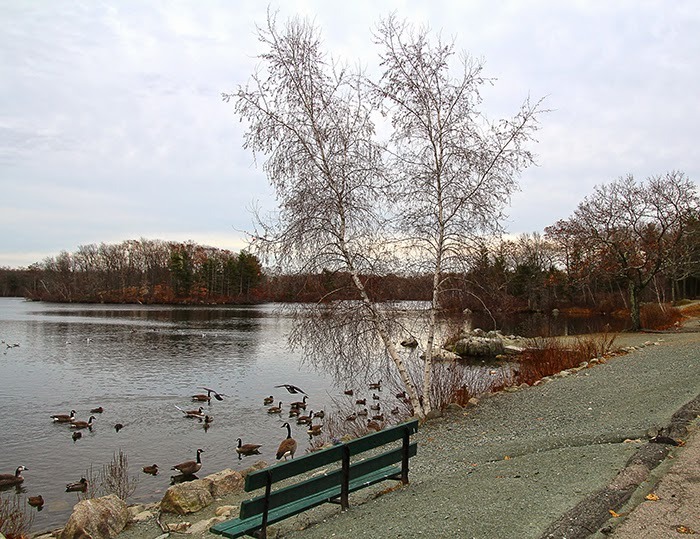 Today, Pogo and I will be going to the Post Office to mail off a birthday box, and then maybe to the park to see if the cormorants are still there. I have another photo to share this morning. 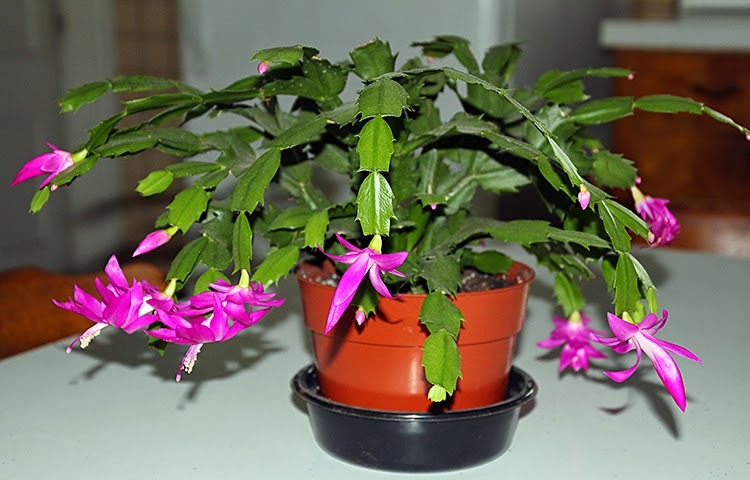 Our Christmas Cactus plant is loaded with blossoms, and is just beautiful. Since I took this photo, several more blossoms have opened. Oh, it is soooo pretty!! The first two or three years that I had this plant, it really struggled to live. I finally re-potted it and placed it on the plant table by a kitchen window. Ever since, it has become more healthy and beautiful. Soon, it will be needing an even bigger pot. Well, that's about all the news for this morning. It's time to get dressed and head outdoors to enjoy this fabulous day. So, till tomorrow, Y'all have a wonderful day. Good morning. Well, it's warm this morning, 54F degrees and working up towards 64F. However, it's also gray, wet and windy. Tomorrow is supposed to be in the mid 60's and then dropping down to the 30's at night. After that, the temps are all down hill for the rest of the week. I'm watching the Red Carpet event at the American Music Awards (on TV, of course), and I must say that I am not very impressed with some of the messy hair do's and semi naked clothing. Don't get me wrong, I really do love fashion and pretty things. I'm just not very modern, I guess. Right now, there is a young woman (I don't know her name) being interviewed, and she is wearing a wickedly horrible dress designed by Zac Posen. He is a judge on my favorite TV show, Project Runway, and I've always wondered at some of the comments he has made about some of the contestants' designs. Now I'm understanding a bit, and I'm not very crazy about his taste in design. If it weren't for the fact that some of my favorite TV shows are not on regular stations, I might think about getting this. However, the programs that I watch the most are on cable stations. Oh well. The Red Carpet Event is over and now the Kardashians are on TV. I don't watch this program, but the remote is on the other side of the room so I can't change it yet. Mama Kardashian has just wet her pants on live TV, and her daughter is telling her that she needs to start wearing diapers. Excuse me, but just when did this type of program fare become popular? Hold on while I get up and get the remote so that I can change the station. **** I'm back. I have changed the station and am now looking at NCIS. Much better!! I'm glad that we have so many re-runs of all the good TV shows. 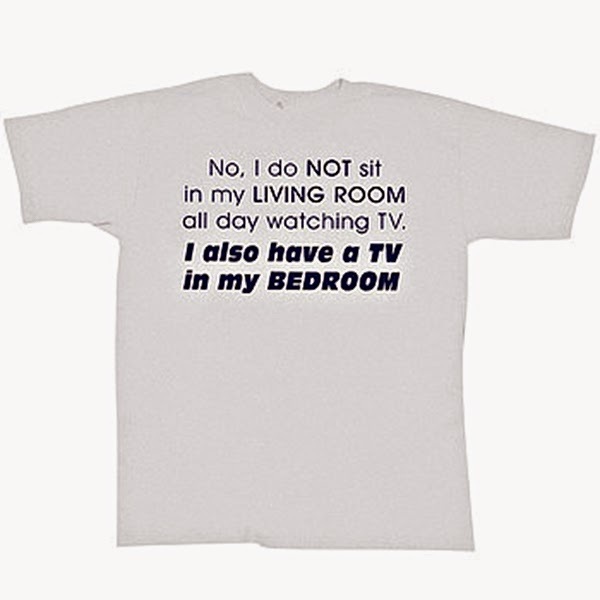 If we didn't, I probably wouldn't watch very much TV at all. This past weekend, daughter Audrey and her hubby Mac celebrated Thanksgiving with their daughter Andi and granddaughter Alena. 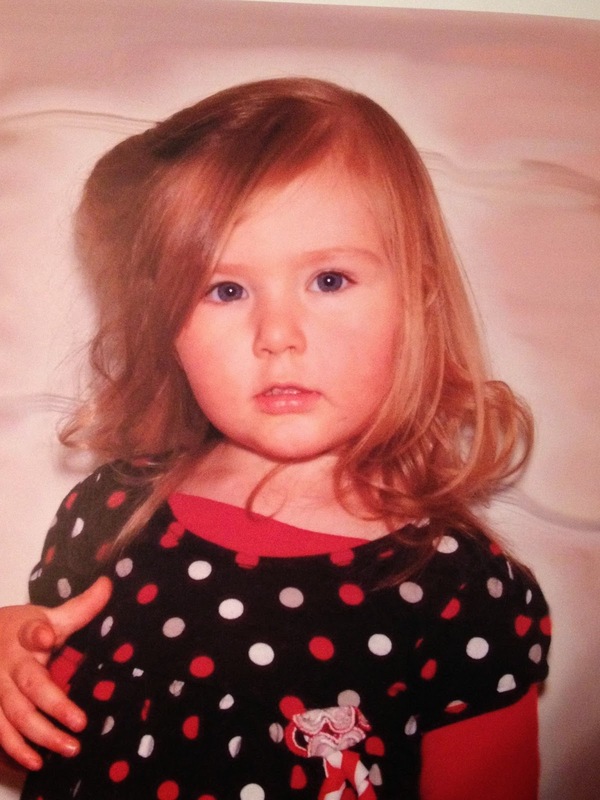 Alena is two years old now, and already knows all her letters and numbers and how to spell her own name. Proud Grandpa took a "Retro 60'ish" photo of Alena and emailed it to me. Isn't she beautiful? I think she looks just like her mama. Mac, this is a wonderful photo, and I love the retro effect. Alena is so adorable, and I can't wait to see more photos of her. My weekend was rather quiet. I started a couple of new afghans; a Delft Blue one and a Frosty Green one. Once one of these is finished I want to start one using the hot pink yarn. I don't know who they will be for, but I'm sure I'll figure it out sometime during the year. My little guy is patiently waiting for me to find something better to eat than the dog food that I served him earlier. Lately he's not into the dog food at all. Last night I broke down and finally cooked him up a steak. You know he wolfed that down as soon as the plate was set on his dinner mat. He even came back asking for seconds. And yes, I'm a softee and I got him some more. I just can't stand to see him go hungry!! Well, that's my news for this morning. Till tomorrow, Y'all have a fantabulous day. Good morning. It's cloudy this morning, but the temperature is much nicer. It's in the mid 40's right now, headed for the mid 50's. Tomorrow will be even nicer before it turns cooler again. In a little while, the sun will be shining. It's a good day to be out doing some errands. These past couple of days have been busy around here. 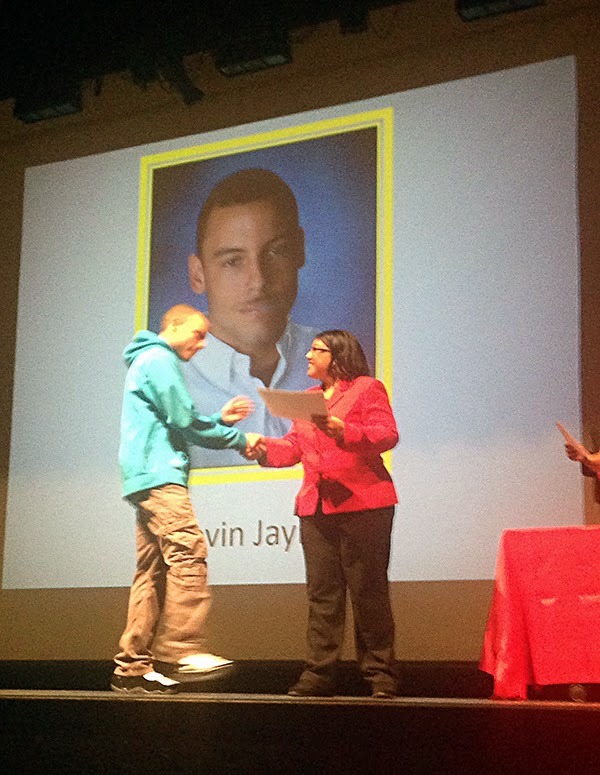 Report cards came out and granddaughter Jasmine received High Honors, and grandson Kevin received Honors. I am so proud of these two kids. 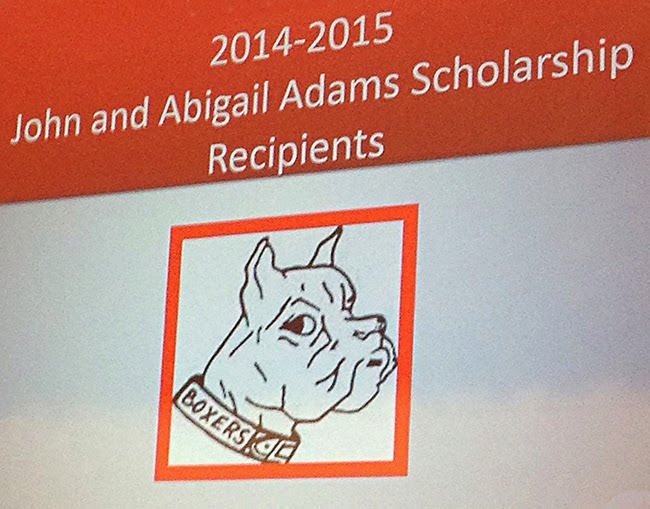 Then, Friday morning, Kevin received the John and Abigail Adams Scholarship Award at his high school. Then, Friday evening, Jasmine's Theatre group held a fundraiser event complete with entertainment. 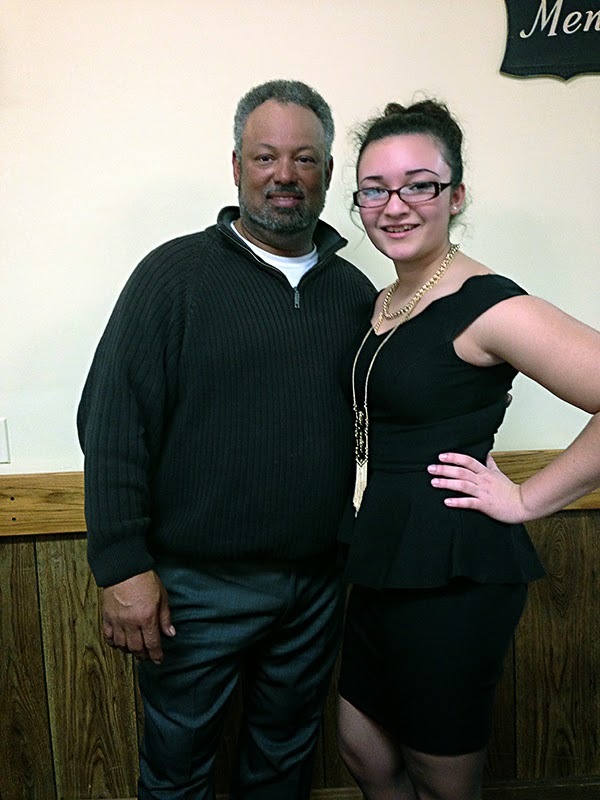 All the members got dressed up, and our Jazzy looked just gorgeous! Here she is with her proud Mom and Dad. 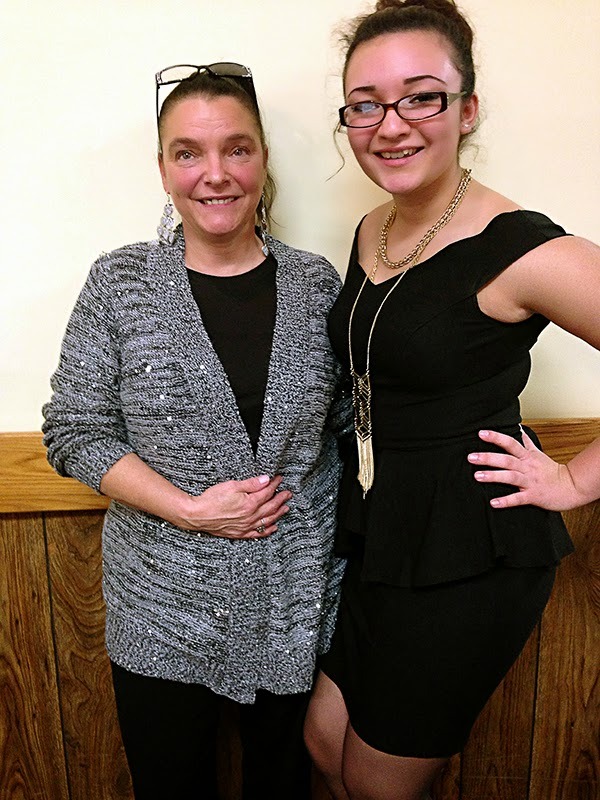 It's a Grandma's job to brag about her young 'uns, and I'm enjoying it. I sure wish my Michael could be here to watch these two young folks growing up. 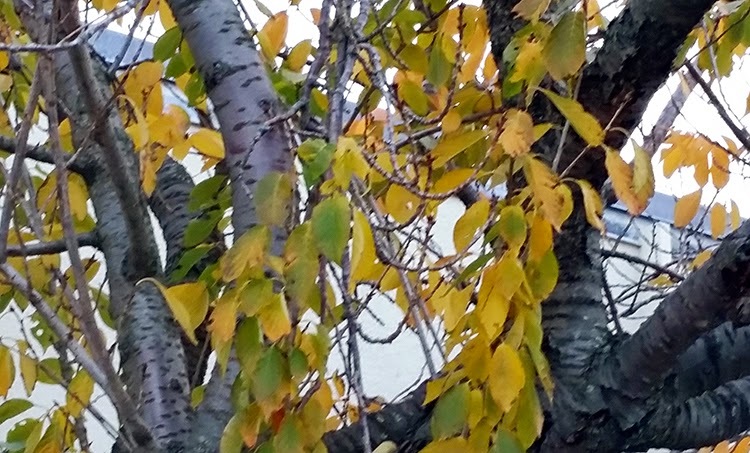 In my travels around town, I notice that we still have quite a bit of beautiful Fall colors. I took this shot through the windshield while parked by the bank downtown. Even though I'm not so crazy about the colder temps, I do love the "coat of many colors" that Mother Nature wears this time of year. Yesterday, I prepared my turkey, and put it into the oven to roast while I worked on a bit of crocheting. Several hours later, after it had cooked and cooled a bit, I cut it all up. First I made a plate for Pogo, then a turkey salad for moi. Then I put a few portions into freezer bags for later, and gave the carcass with meat still on (plus legs and wings) to Joe. He finished plucking the rest of the meat from the bird. 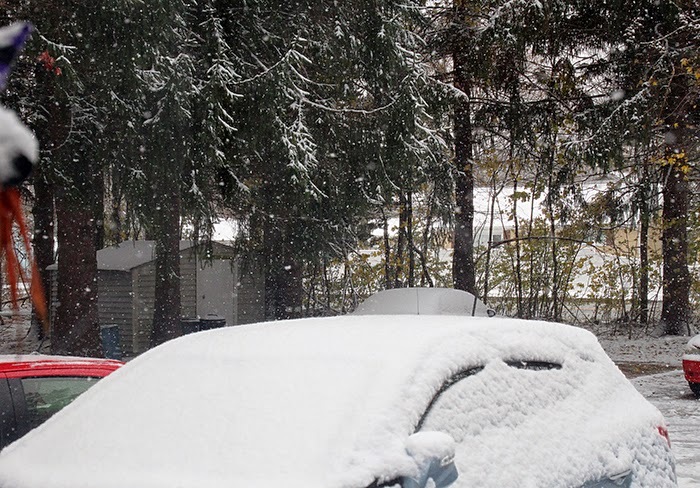 I'm not going to go on a political rant about all the snow that has fallen in New York and the problems it has been creating, but I have to wonder why so much time is spent in the news about what to do about getting rid of all the snow. With so many areas of our country still in sever drought, why hasn't any of the snow been dumped into open cars on freight trains and shipped to these drier areas? Wouldn't this idea cost less in human misery and money? And what about the rain that is going to be falling on top of all that snow, causing mucho flooding? If most of the snow had been carted away by train, the rains would not be such a problem. (Think how happy a lot of farmers would have been to have all that snow watering their land.) I really think my brain was born before it's time. Well, now I'm going to have me another cup of coffee and do a bit of blog reading. Till tomorrow, Y'all have a wonderful day and stay warm. Good afternoon. Gosh, I did not realize it was so late. I sat down this morning to type my blog post and noticed that I had to bills to pay and get in the mail. So, I got out the checkbook and took care of the bills. Then I put them out for the mailman but he had already been here. Hmmm. I'm running late with everything. Next Pogo was looking for something to eat, so I fed him. After that, I realized that I needed to go out to the back room and get something. Well, one thing led to another, and the next thing I know, I'm busy wrapping a gift and stacking it on the "ready to go" pile. Of course, by now lunch time has come and gone. Where oh where has my day gone? I made some lunch and sat down to look something up on my laptop and realized that I still had not typed my blog post. How does one keep running out of time when one is retired? About all I accomplished yesterday, aside from some wrapping, was to get the food shopping done. Then later after supper, both kitties were out in the living room at the same time. My goodness, such howls and hisses! However, after a few minutes of this, Blackie settled down behind the chair that Dwarf Mike was sitting in, and Sunshine stayed on the other side of the room for a while. It will take some time for them to finalize a truce, but it will happen. Meanwhile, Pogo really doesn't want anything to do with either of them. Maybe later when the kitties get along better with each other he'll try again to get to know them. As long as they stay out of his territory, they don't bother him. Later this afternoon, I need to go back to Walmart to pick up some meds that were not ready yesterday. While I'm there I need to pick up a meat thermometer and some parmesan cheese. I forgot both of these items yesterday. 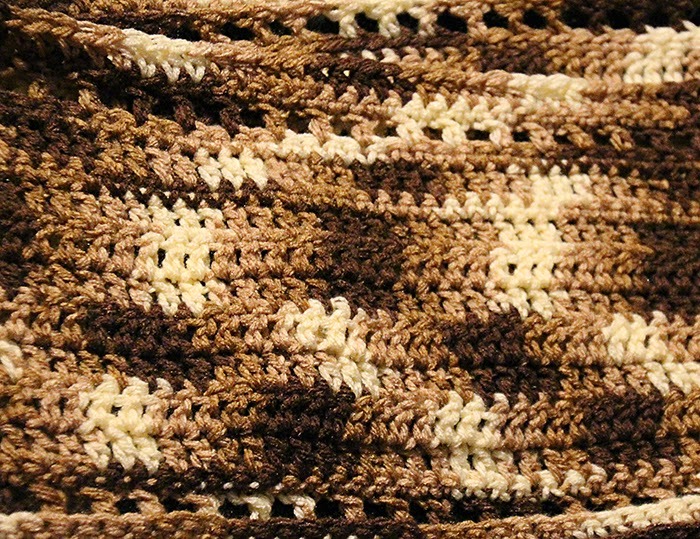 The scarf that I'm working on is coming out so pretty. I'm hoping to finish it up later this evening or tomorrow. Then I'll take a photo to share. After that, I'll finish up the lapghan that I started a while ago. It only needs a few more rows. 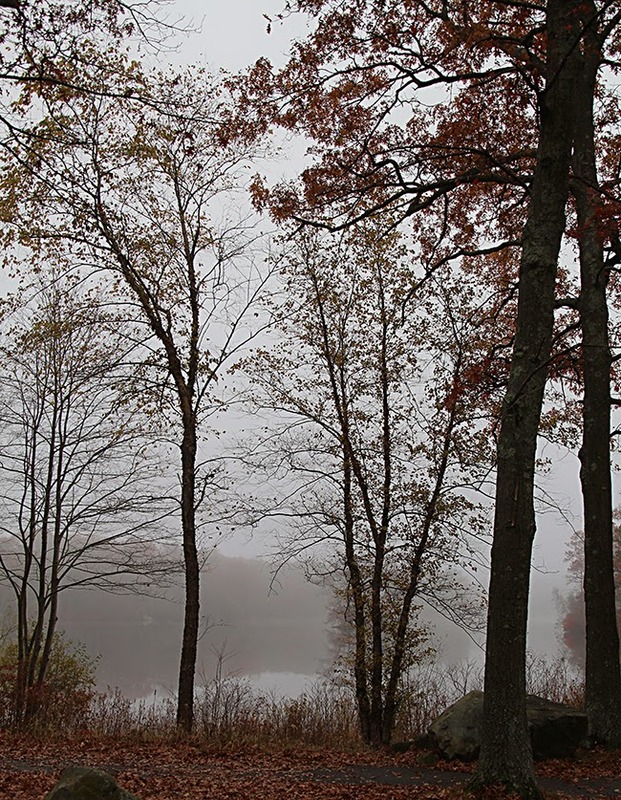 Today I have two more "foggy photos" to share. I promise no more of them for a while. I just happen to like these photos. A friend sent me some cute mug images, and I copied this one to share here. It rather fits me on so many occasions lately. 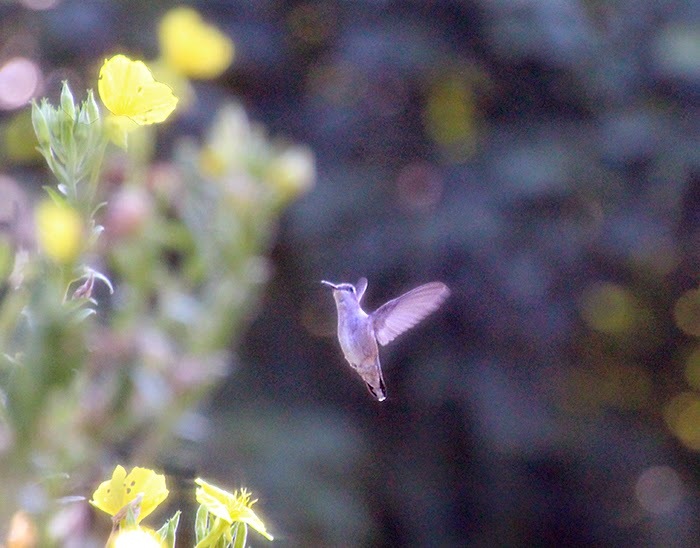 Sorry it's such a fuzzy image. Today the sun is shining, and it's 35F degrees. I think I can live with this considering what other folks are dealing with. There are folks in New York who can't even get out of their houses because the snow has covered over the doors. Other folks were stranded in their cars because they had to pull over to the side of the road because of poor visibility, and then their cars got covered in snow. Hopefully, the warmer temps that are coming will help these folks out a bit. Well folks, there's not much else happening here today. Now it's time for me to get ready to go to Walmart. When I get back, it will time to start supper. Gosh, it sounds like all we do around here is eat eat eat. lol. So, till Sunday, Y'all have a fabulous weekend and stay warm. Good morning. My goodness, I slept in really late this morning. Maybe it's because I stayed up half the night working on a new scarf? Oh yeah, my hands have been feeling lost now that all the holiday crocheting is done. It's sort of like yarn withdrawal. Definitely not pretty!! Yesterday, after my appointment at the nail salon, I decided to go get the birdseed by myself as long as I was already out. Three 25 pound bags was about all I could handle. When I got home, I left them in the car and waited for Joe to come home and bring them into the house. Last evening, DIL Janet came by, and we had a most enjoyable visit. I took her out to Dwarf Mike's room to meet our newest kitty resident. Blackie was stretched out on the bed, and quite comfortable indeed. This pussycat has made it quite clear that Dwarf Mike's room is his new palace and he is not leaving anytime soon. Did I mention that we've discovered that Blackie is a "he", not a "she"? No problem. Miss Sunshine (aka Luna) will be getting spayed soon. Sorry kitty! I just love baby kittens, but I definitely do not want any here. Two cats is plenty. After Janet left to go home, I took out all the "gifty" stuff to make a list of what I might still need. I was pleasantly pleased to find that it is a very short list. Then I taped up two boxes and put mailing labels on them. Hmmm, I'm going to have to make more than one trip to the Post Office to mail everything out when the time comes. Next I got out some of my new yarn, and started a new scarf. This one is in blue tones. Ahhh, my hands are feeling more happy now that they are playing with yarn again. By the time I put everything down and crawled under my blanket, it was almost 3 a.m. My goodness, how time flies when you are having fun. Today I have two more "foggy" photos to share with you this morning. I took these at our local park. 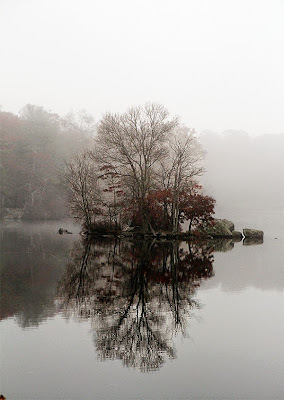 For me, "Fog Photography" is so very interesting. I find the finished photos very soothing to look at. I also have another "news tidbit" to share with you. Jose Canseco had lost a finger, and it was surgically put back on (to his hand). It seems that while he was doing something (I forget what) recently, the finger fell off. Now he is planning on selling his finger on eBay. This should be interesting because eBay does not allow body parts to be sold. But be honest folks, who in their right mind would actually want to buy a human finger? There are some real sickies out there. Well that's about all the news for this morning. I'm going to have me another cup of coffee and settle down with my new crochet project. So, till tomorrow, Y'all have a wonderful day. Yeah, My Holiday Projects Are Finished! Good morning. The sun is shining, but it's not tempting me to rush outdoors just yet. It's also quite cold! Later this morning I do have to go out for an appointment at the nail salon. 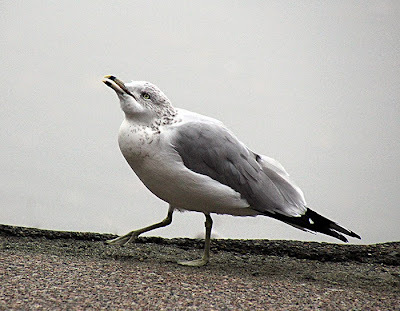 Perhaps while I'm out, I will stop and pick up some more bird seed. Or maybe I'll wait till Joe gets home from work, and ask him to go with me. The bags are heavy for me to lift. Yup, I think that is a better plan. There were a couple of interesting items in the news yesterday. One was that Charles Manson is getting married. Can you believe that? After all the atrocities that he is responsible for, I cannot understand why he is allowed to marry. What exactly is prison for? Especially for someone like him? I just don't understand this legal system of ours. The other interesting article was about "Drive Thru Church" for folks who just don't have the time to go to church. The pastor being interviewed explained that we have a drive through for food, dry cleaning, medicines, etc. So why not a drive through for God? You drive up to the window, the pastor comes out, gives you a brief sermon and blesses you. Amazing! I wonder what folks will think up next. 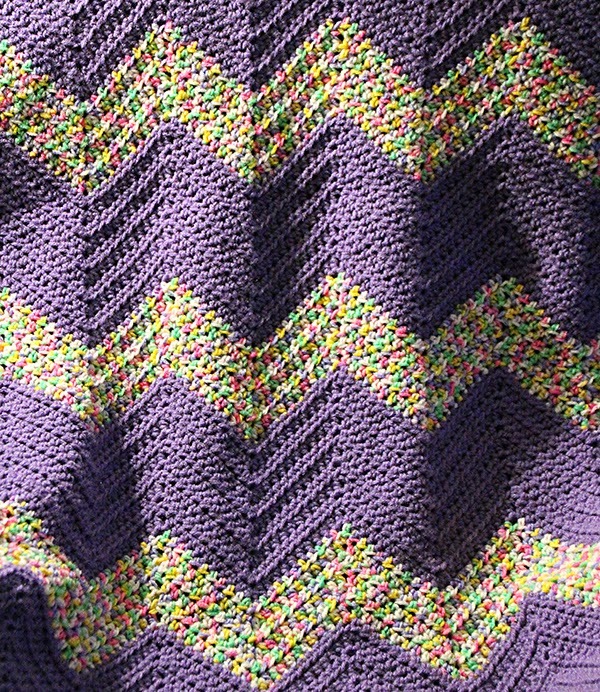 Well, I have finally finished the lavender afghan. Phew!! All my holiday projects are finished. This year I made sixteen afghans. Last Winter, if anyone had told me that I would make that many afghans before Thanksgiving, I'd have said that they were crazy. Hmmm, funny how things work out. Here's a photo of this last afghan, and also one of the scarf that I finished. I'm already thinking of things that I could have or should have made, but well, there's always next year. Now I need to focus on finishing up my wrapping, addressing envelopes, etc. Tonight, I will take the turkey out of the freezer, and put it in the fridge to start thawing. I'm hoping to cook it over the weekend. Well, now I think I'll have me a second cup of coffee and do a bit of blog reading. Till tomorrow, Y'all have a fantabulous day. A New Pogo Toy On The Market! Good morning. Brrrrr! The Artic cold is setting in around here. At eleven p.m. last night it was 51F degrees here, and this morning was only in the 30's. We'll be having 30's for daytime and 20's for nighttime temps for the rest of the week. I guess this is where my semi-hibernation kicks in. It's time to check the calendar and start my countdown till Spring. Last evening, I started working on the kitty house. Joe and I checked the styrofoam cooler for size, and decided that we needed to shave about a quarter inch off its height. While we were deciding the best way to do this, Dwarf Helen came out and informed us that Blackie was already in our house. It seems that it was so cold and wet during the night that she actually tried sleeping in the makeshift house on the porch. Dwarf Helen heard her out there and opened the front door. Blackie was so glad to come in where it was warm and dry. Dwarf Mike took her into his room, and Blackie curled up on his bed and slept comfortably all night. Blackie has since been offered the opportunity to go back outside, but she is content where she is. Well, how about that!! I will probably still make the kitty house. Who knows? We may need it anyway. Does everyone have their Thanksgiving turkey safely tucked away in their freezer? If not, you may be out of luck this year. 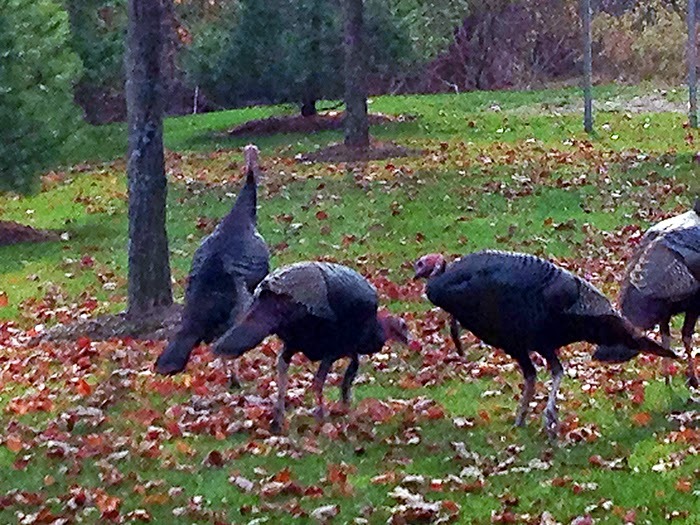 They are saying on the news this morning that there is a turkey shortage this year. Hmm, well Pogo and I already have our bird. I'll be thawing it out later this week, and cooking it before Thanksgiving. I'm not a big turkey eater, but I do love turkey salad. So, once my bird is cooked and cooled, I'll cut off the meat and package it into freezer bags. 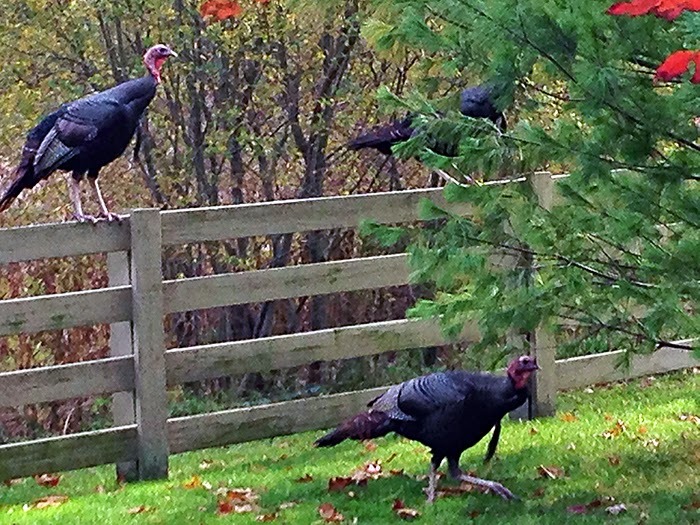 This way, we can have turkey or turkey salad whenever we like. This week, we'll be buying another, bigger turkey to be cooked on Thanksgiving Day. This one will be served at the "family" gathering in the main part of the house, along with lots of other yummy good foods. 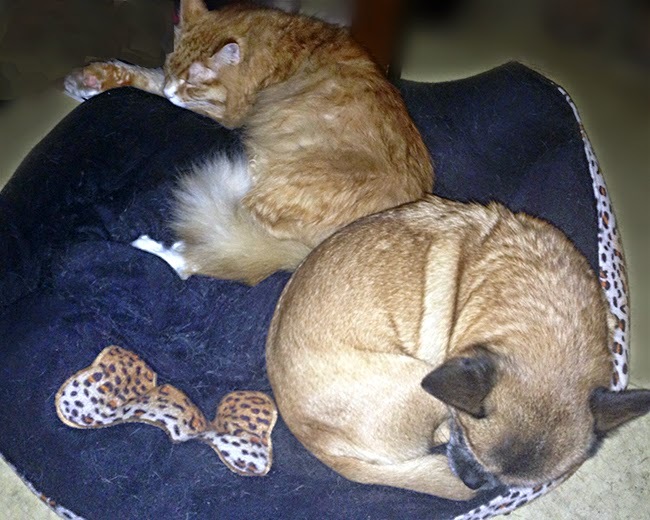 Deanne sent me a photo of Sassy and Kitty, the homeless cat that adopted them, sleeping together in one bed. Hopefully, this is how Pogo and the kitties in our house will be able to get along some day. Hmmm. it doesn't look as if it will happen anytime soon, but we can hope. I also have a picture of an ad for a new toy. Can you believe???? There is actually a toy on the market that is named after my little Pogo!!! 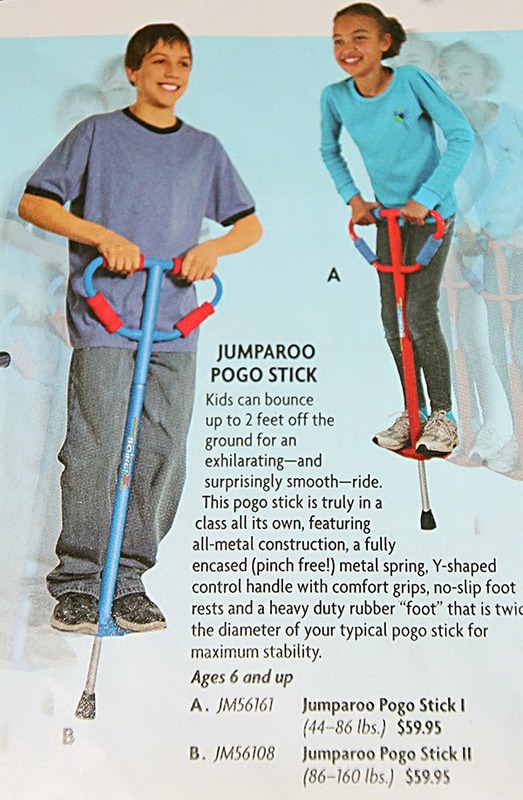 It's called a Jumparoo Pogo Stick. You step on to the footrests, and hop around like my Pogo does when Sunshine sneaks up on him. Hmm, I wonder if Pogo will be getting royalty checks? Well, I think it's time to get busy and do a few chores around here. Later I want to work on the lavender afghan. I've been neglecting it lately so that I could finish up a scarf that I had started a while ago. Well, the scarf is finished. It looks so good that I think I'll make another one soon. Do you realize that as I sit here typing, it is below freezing in 49 of the 50 states? Wow, I don't think I've ever seen this happen before. Brrrr! On that wicked cold note, I'll take my leave. So, till tomorrow, Y'all have a wonderful day and stay warm! Good morning. Well, it's cool and wet here in my little part of New England. Although we are expecting the temps to get up to the mid 50's later today, the next six days will only be in the 30's and low 40's. There's a twenty degree drop expected tomorrow from today. It makes me wonder what kind of Winter we'll have. Brrr. Yesterday, I got the laundry caught up, and then spent some time working on a crocheted scarf. I probably ripped out two scarfs worth of yarn before I settled on a pattern for this scarf. Some days I just can't make up my mind if I like something or not. I also spent a little while signing my holiday cards and calendars. Basically, I'm in pretty good shape as far as my holiday shopping and creating goes. I must say that it feels good. I really don't like the chaos of last minute shopping and wrapping. Last evening, daughter Deanne brought me a styrofoam cooler to use as a liner for the kitty house. While I was shopping the other day, I picked up an air conditioner cover to use as an outer cover for the kitty house once it is finished. This will help to protect it from the rain and snow. Joe might be bringing home some styrofoam sheets this afternoon, so I'll hold off cutting into the cooler till then. I'd like to be able to get the house finished by tonight. Today I have a cute tee shirt design to share. This is one of the reasons I love catalogues. You never know what you'll find in them. I admit I spend a lot of time in my living room watching TV, but I'm also crocheting at the same time, so I guess it's okay. I found this cute little item on my daughter's Facebook. Maybe if we were just a wee bit smaller, this could work? Well, there's not much more news this morning. Oops! I almost forgot. I heard on the news this morning that we could run out of chocolate in five years. This could be disastrous to all us chocolate lovers. 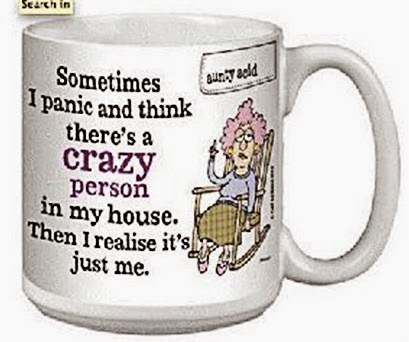 Now I'm off to the kitchen to make myself a cup of coffee. Till tomorrow, Y'all have a fantabulous day. Good morning. It's looking a bit cloudy and cold outside, and I'm going to leave it out there. Today I will get caught up on my laundry. Plus I want to work a bit on winterizing the tote that I bought to make a house for Blackie. A video on the web showed how to insulate the tote by using a Styrofoam cooler to line it with, but I'm having a difficult time finding a Styrofoam cooler the right size. Today I will try to think of ways to improvise. When I was a very young mother, we lived in a summer cottage for a while. When the cold weather started, I tore up the flooring and insulated the floor boards with tar paper and newspapers. Then I replaced the linoleum flooring. It helped quite a bit to keep the cold from coming up through the floor. Toilet paper tubes - a half roll for the small toy and a full roll for the large toy. 1. Ch 20, join with sl st to form ring (keeping tension firm but not tight - you want both ends to be a little tighter so they hug around the toilet paper tube). Make sure to not twist your stitches. 2. Ch 2 in first chain and then dc in each remaining stitch in round. Sl st in last stitch in round to join. Repeat for 7 rounds for the half paper roll size toy, or 11 rounds for full size toilet paper roll. 3. Finish off last round with 1 sl st in each stitch and join. 4. Ch 30, then make 2 dc in the 3rd chain from the hook. (If you'd like a longer curlicue then make the chain longer). 5. Make 3 dc in each chain until you get back to the start of the chain. Sl st to join. Fasten off and weave in ends. 6. Sew bell on end of curlicue. Fit over toilet paper roll. Good luck, and I hope your kitties like the toy. I'll be trying this pattern soon to make toys for Sunshine and Blackie. A friend sent me an email with pictures of products from the past. 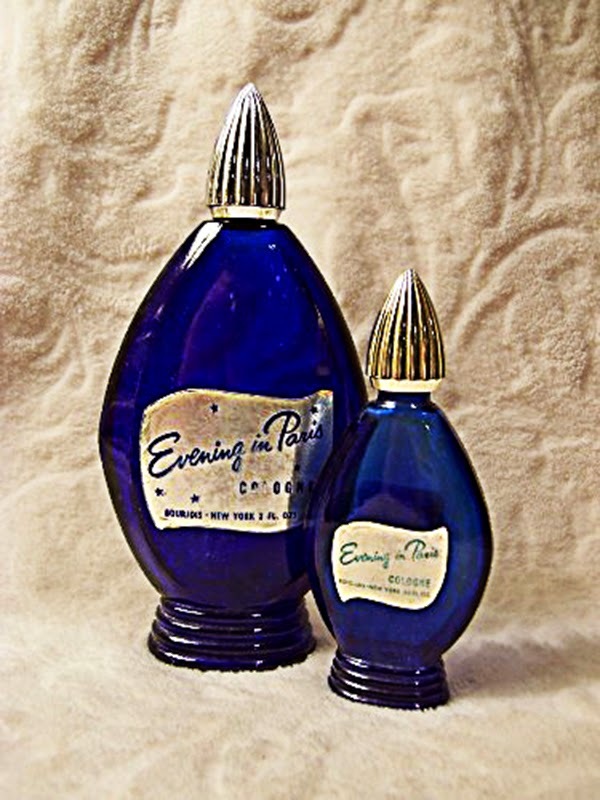 One of the pictures was for Evening in Paris, a very popular perfume from 1940's. It was my mom's favorite, and every year Daddy would buy her the whole set (perfume, powder, cream) for Christmas. I loved that smell. It held such wonderful memories for me. Last year, I found some Evening in Paris cologne in a catalogue, The Vermont Country Store. It was a lot more expensive that I remembered, $50 for a small bottle, but I bought it any way. I could not wait to open the bottle and smell that wonderful fragrance again. Well, let me tell you, that it just wasn't the same anymore. I could barely smell the fragrance, and it brought back no warm happy memories. Hmmm, I wonder. Why is this? Ah well, at least looking at the bottle takes me back in time for a minute or two. It's rather sad how some familiar things can be so different to us as adults. Yesterday, Dwarf Helen went shopping with me to buy more Christmas wrapping paper and a few other small incidentals. Then last evening, I spent some time working on the lavender afghan, and it should be finished soon. I have only about thirteen more rows to go. Woo Hoo!! Well, that's about all my news for this morning. Now I'll start some laundry. So, till tomorrow, Y'all have a fantabulous day. Good morning. Tis a bit nippy here in New England. It rained and snowed during the night. 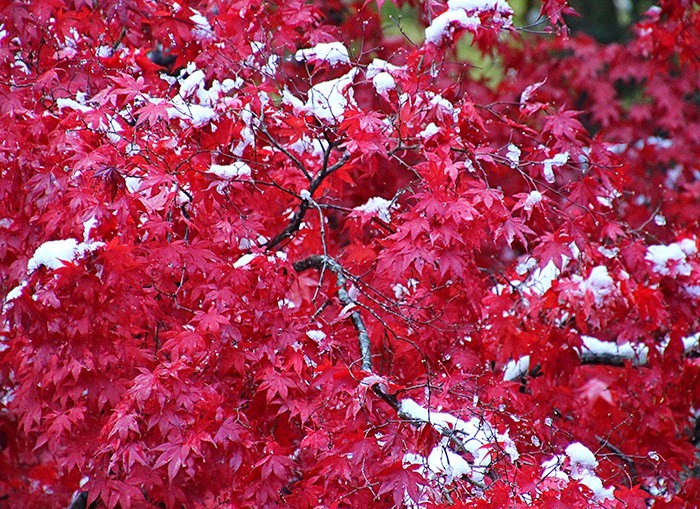 I'm not a big fan of snow, but a sprinkling of it on my Japanese Red Maple is oh so beautiful. Isn't this a pretty sight? 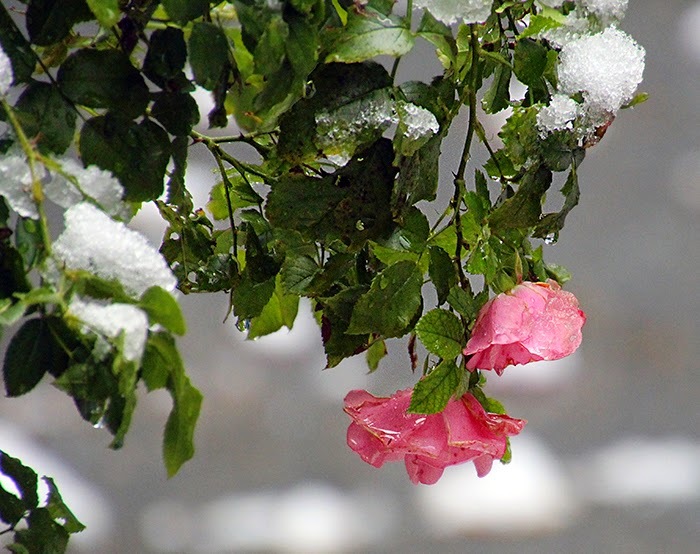 While I was outside taking this photo, I noticed how the rain and snow raised havoc with the roses on the pink rose tree. They are trying so hard to bloom, but Mother Nature is not making it easy for them. Yesterday was a rather quiet day. Blackie came around in the afternoon as Joe and I were leaving to go food shopping. We took a few minutes to play with her before we left. While we were at the store, I bought more lavender yarn, and a big bag of kitty food. As soon as we got home, I put out a bowl of food for Blackie, and she ate every bit of it. Because it was going to be so cold during the night, I was trying to figure out how to put together a makeshift shelter for her. But when I went out looking for her, she was not there. I surely do hope that she really does live in someone's home. 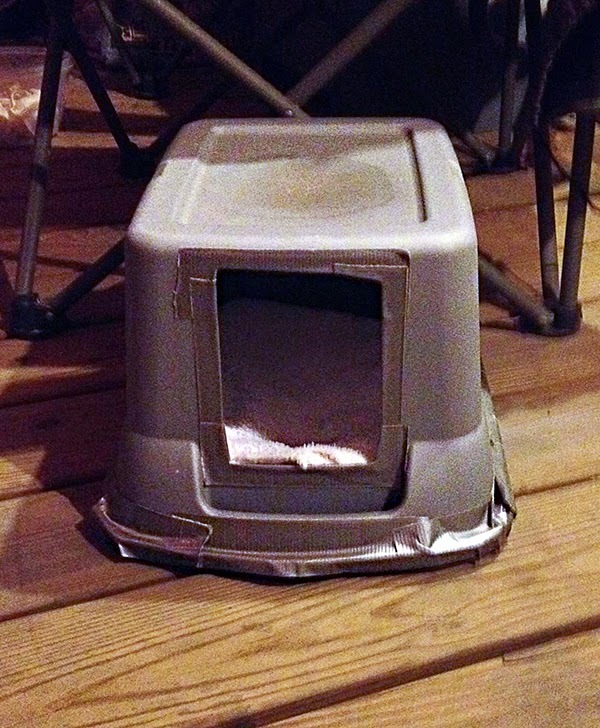 Daughter Audrey took a photo of the "tote shelter" that she made and keeps on her front porch for those nights when her eldest cat does not come indoors. She made it from a plastic tote and some towels. I think this is a pretty good idea, so I will pick up a tote and make up a little house for Blackie. Our front porch has a roof over it, so we'll keep the little house there, along with her food and water. I am still waiting for the mailman to deliver a few more packages so that I can get more things wrapped and packed. Does it sound like I'm enjoying the holiday season? Well I am. It is the highlight of the whole Winter for me. 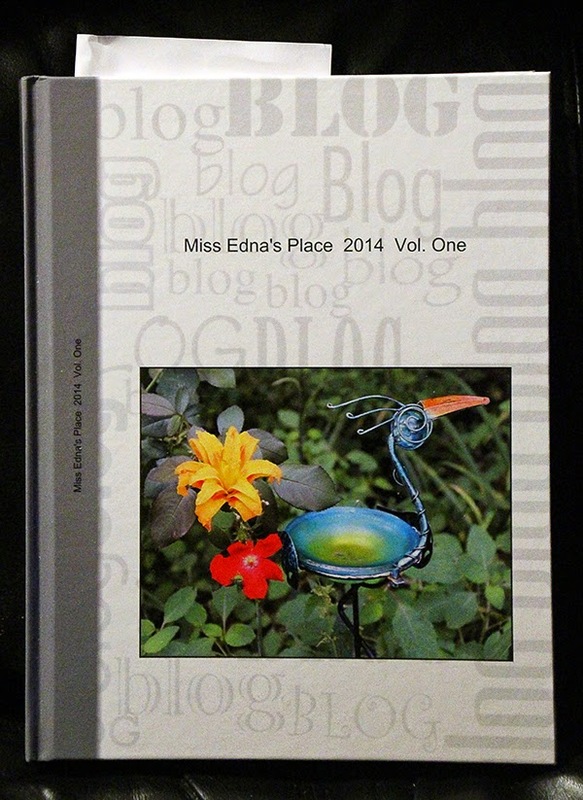 My newest blog book came the other day, and I took photos of it to share. A while back, I changed the photo on the front cover to a photo that I took during that time period. And, of course, my favorite little fellow is on the back cover. Here is the first half of this year. The temperature has dropped quite a bit today. It's only about 39F right now, and won't get above 42 or 43F today. Tonight is supposed to be down around 25F. Brrrr! Today will be a good day for me to get comfy in my lounge chair and work on the lavender afghan. 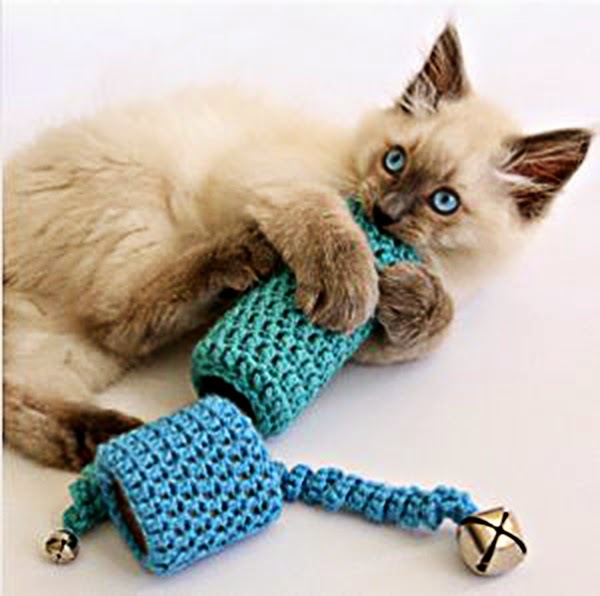 Before I end this post, I want to share an image of a crocheted cat toy. If anyone is interested, let me know and I'll dig out the pattern. Well, that's all the news for this morning. Now it's time to make a nice hot cup of coffee and do a bit of blog reading. Till Sunday, Y'all have a fabulous weekend. 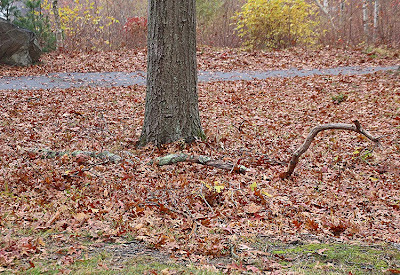 Ooooo, A Monster In Our Park! Good morning. It's sunny this morning, but quite a bit chillier. That frozen band of Artic air has arrived, and is in no hurry to go away. At least, with the sun shining, it does not feel so bad. I was working on the lavender afghan last night, and you're not going to believe this, but I ran out of yarn. With all the yarn that I have, I ran out of the one color that I am using. Of course, there is a perfectly good reason for this. Originally, I was making this afghan with double strands of yarn. Then I stopped, and switched over to the current one with one strand of yarn. I just did not have enough yarn for both afghans. Some day when my hands are feeling much spryer, I may pick up the two-strand afghan and finish it. Later today, (or tomorrow) Joe and I will be going food shopping, and I will pick up more lavender yarn at that time. Meanwhile, I have other projects that I can work on. I also need to finish addressing the rest of my holiday envelopes. I have about half of them done. I must say, being retired does afford me lots more time to do the things that I want to do. This morning I spent some time going through a huge pile of "junk" mail. I put most magazines, catalogues and miscellaneous mail in this pile because I just don't want to deal with it at the time. However, it does get to a point where I just have to sit down and go through it all. So now it is done till the next pile. lol. 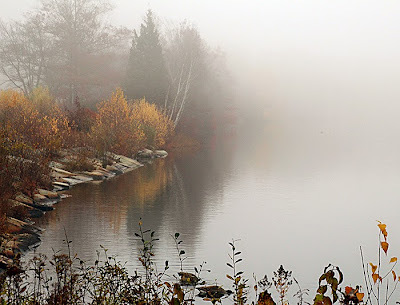 Today, I have a few more "foggy" photos to share. This first photo was an added surprise for me. I haven't seen any cormorants all year, but then I thought I spotted what looked to be a couple of them way off in the middle of the pond just sitting on a rock. I drove to a spot that gave me the best view of them. Imagine! Two of them! This is a treat for our area. 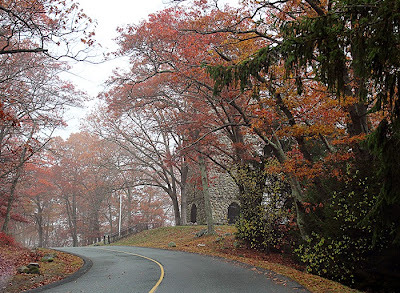 Next, I drove up the little hill by the observation tower. The colors up here are ever so pretty, and the fog makes it look so mystical. As we were leaving the park, I spotted what looked like the Loch Ness Monster. It wasn't, of course, but this could be our park version "The W. Field Pond Monster". Look carefully. 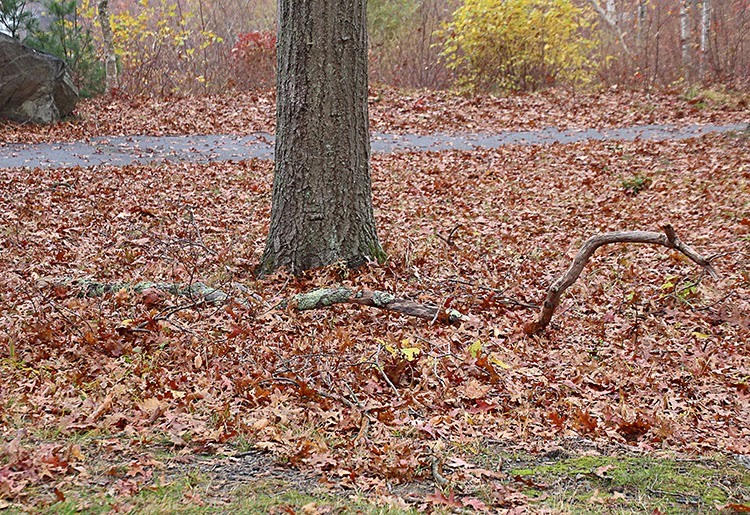 It is gliding through the fallen leaves. Well, that's about all the news for this morning. Now I must get busy and make up my shopping list. Then I will look around outside to see if Blackie is out there. I have a plate of food ready for her. So, till tomorrow, Y'all have a magnificent day. Good afternoon. This morning, Pogo, Dwarf Mike and I went to the dealership to pick up his deposit, as he did not get the new car. All is not lost as he will go out later today looking at more cars. It has been very foggy here all day. 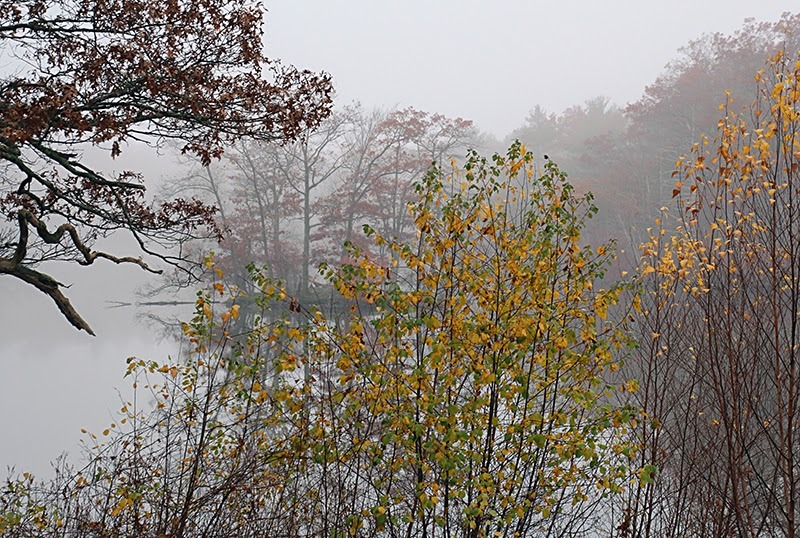 Once we got back home this morning, I grabbed my camera and Pogo and I set out for the park to get some really neat fog photos. 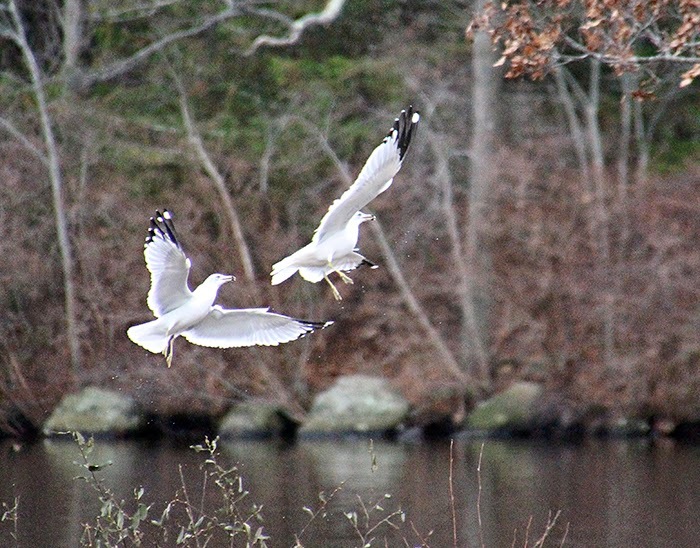 I also got a couple of neat photos of the gulls. 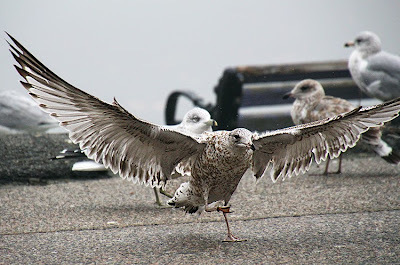 As you know, these are some of my favorite birds to photograph. They have such wonderful character and grace. 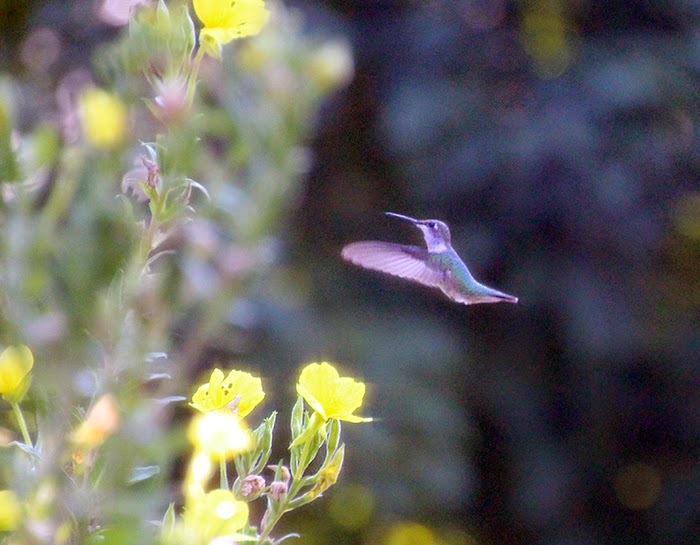 I have lots more photos, but I have to go through them and crop a few. Goodness, I just made lunch for myself and Pogo, and I learned that he likes Genoa Salami. Hmmm. I only bought a half pound, but next time I'll get a whole pound. I like it too! The sun is shining brightly in my yard now, but the TV says that we are still having a dense fog alert for another couple of hours. 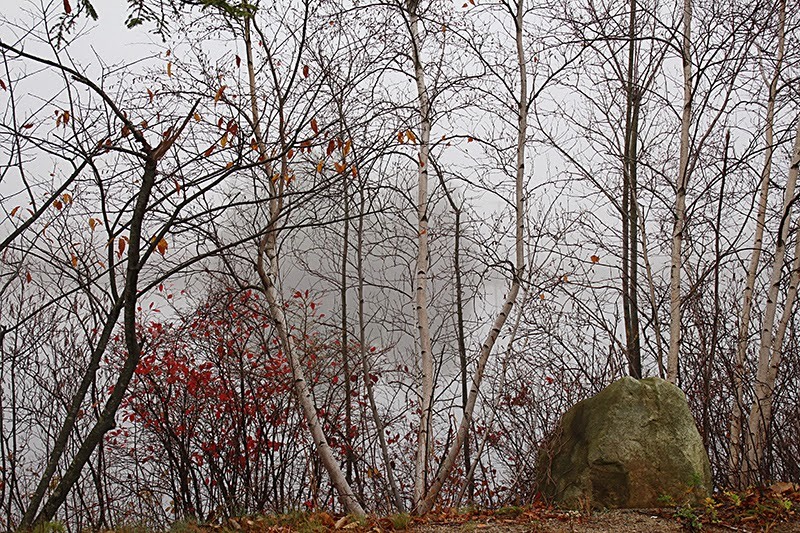 No, I'm not going back out to find more fog photos. I need to work on the lavender afghan. I only have forty more rows to go. I would like to have it finished before Thanksgiving. Blackie has been outside my door all day. And yes, I fed her a big plate of food this morning before we went out. I think she has been sleeping outdoors because she had leaf residue on her this morning. I wonder if we can coax her in overnight soon. The nights are getting very cold. 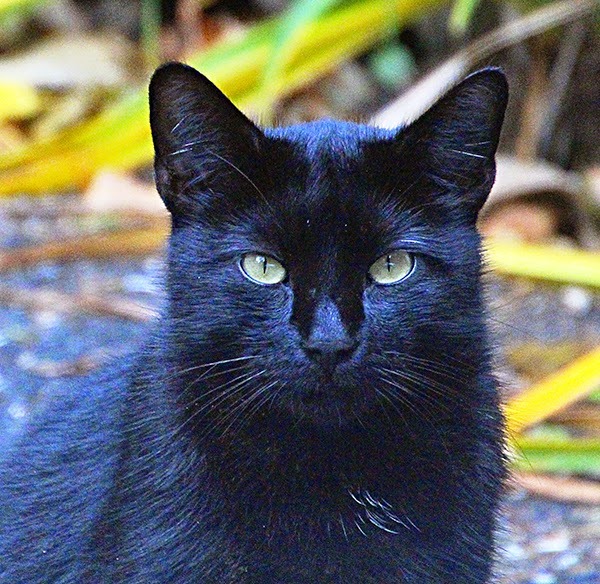 Here's our beautiful Blackie. She is oh so lovable that I'm wondering if maybe her family moved away and left her behind? Oh gosh, how can any decent person do something like that? We will keep trying to coax her indoors. She will come in now, but only for a minute or two and then goes back outdoors. This morning she actually came up and sniffed Pogo while I was holding him. She did not hiss at him, and he did not bark at her. Gosh, what do you think? Can they maybe make friends? Wouldn't that be nice. Well now it's time for me to get busy around here. DIL Janet will be coming by after work. Tonight we will have the macaroni and cheese that I was going to make for last weeks visit. This is her favorite. So, on that tasty note, I'll take my leave. Till tomorrow, Y'all have a wonderful day.